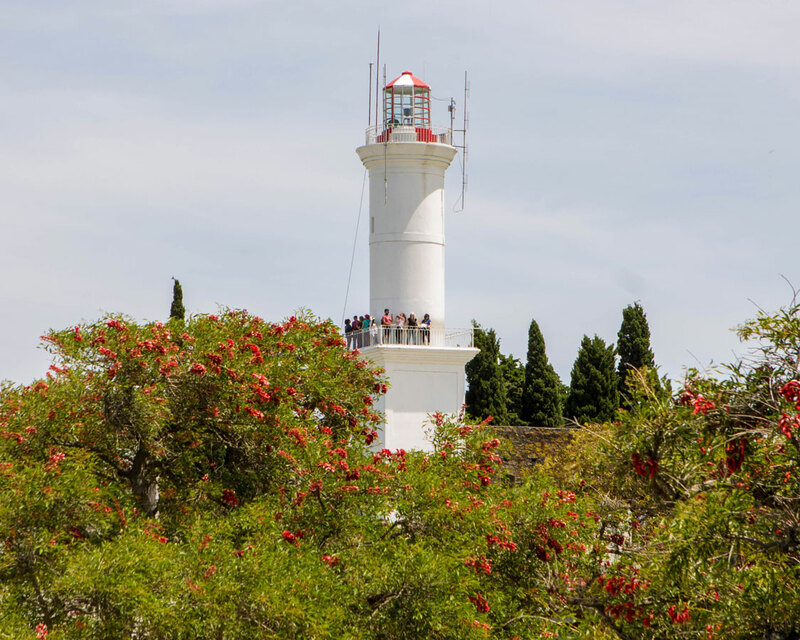 Dating back to 1680, the beautiful and historic town of Colonia del Sacramento is one of the oldest cities in Uruguay. One of its best features is the incredible Barrio Historico which is virtually unchanged for centuries. It is a popular destination for Argentine visitors from nearby Buenos Aires. 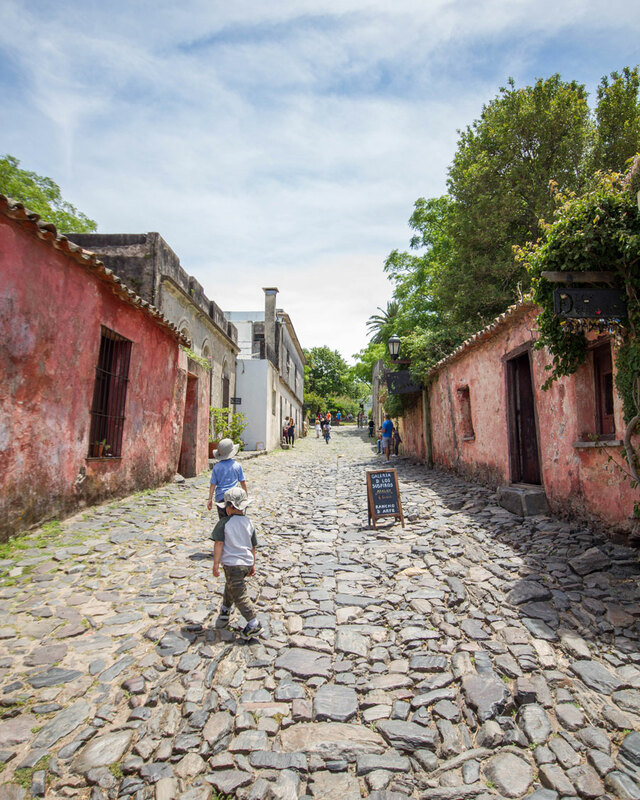 So during our visit to Argentina, we couldn’t resist visiting Colonia del Sacramento with kids. 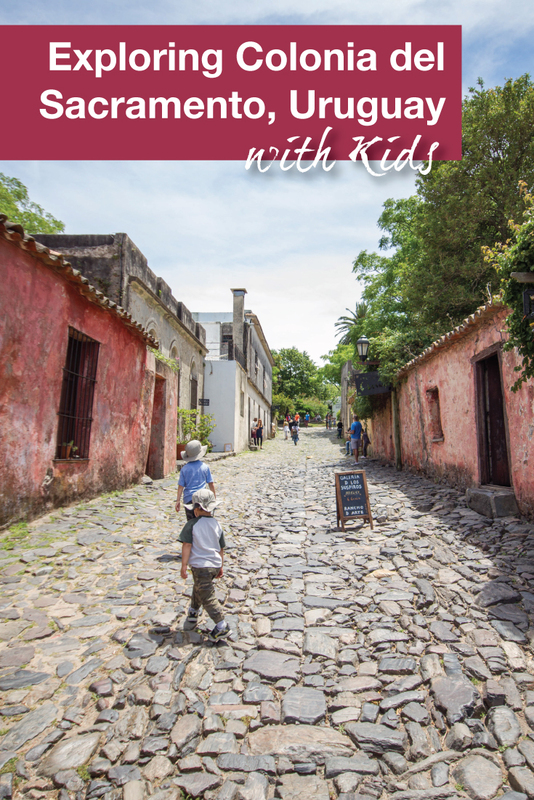 Visiting Colonia del Sacramento with kids is an easy day trip from Buenos Aires. 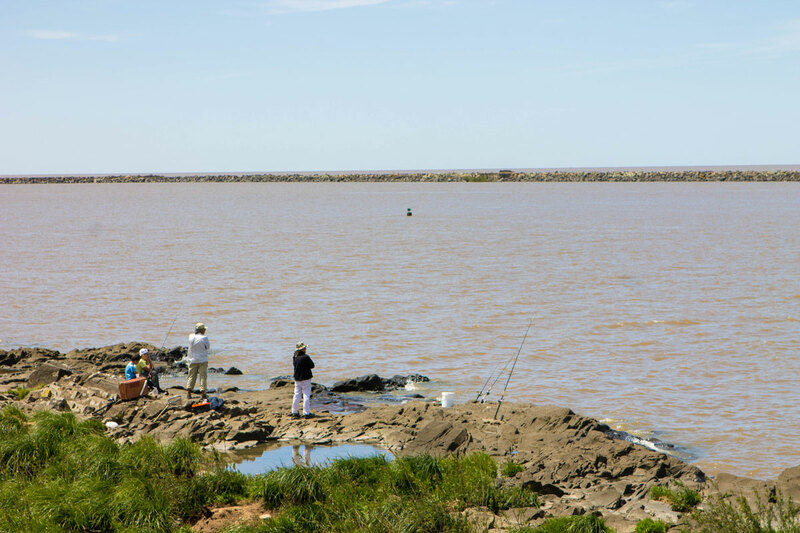 The cities sit only a 50 km ferry ride apart across the Rio de la Plata river. There are two main ferries that travel the route to Uruguay from Argentina, Buquebus and Colonia Express. When we were booking, both ferries took almost the same amount of time (Colonia Express was slightly faster) and costs were almost identical. 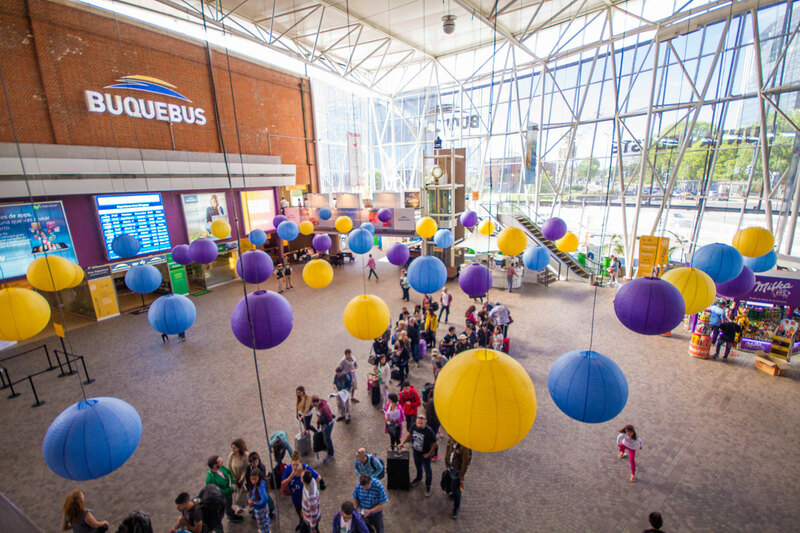 We chose to go with Buquebus as they had the return time slot that we wanted. We booked our tickets ahead of time online from Canada and even received email alerts reminding us of our upcoming trip. Pro-Tip: The two ferries are in different terminals in Buenos Aires. Make sure you head to the correct terminal on the day of your trip.We took an uneventful cab from our hotel to the terminal. Arrive at least one hour early to allow time for passport control. Once inside, it was a tad overwhelming as there are no signs telling us where to go. After asking some people in line, we learned that we had to line up at the very queue that was already forming, to have our tickets and passports checked. Thankfully, a kind gentleman behind us decided to show some magic tricks to keep C and D amused! As we only had the day to visit Colonia, we decided not to overstretch ourselves. Instead, we focused on seeing the sites of interest within the historic district, Barrio Historico. From the docks, we walked about 1.5 km until we reached the towering stone walls of the historic city. A city like this deserves recognition, and rightfully, Colonia del Sacramento was declared a UNESCO world heritage site in 1995. Pro-Tip: It is hard to get lost if you keep the water on your left side. 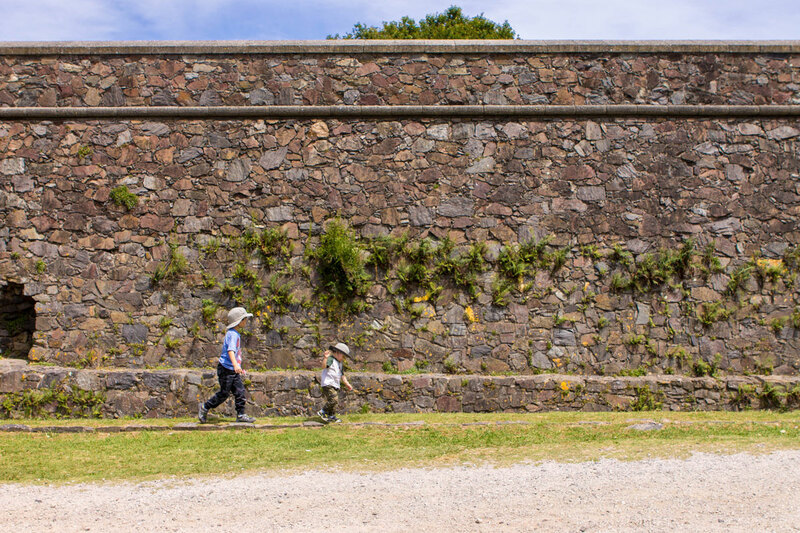 The kids excitedly ran up to walk alongside the city walls. We entered via the reconstructed 1745 city gate, Porton de Campo. Before we knew it, the boys had seen something that caught their imagination. They made a hard left and climbed the steep hill along Paseo de San Miguel so they could get to the canons lining the walls. Pro-Tip: To discover more great South American Destinations, check out this South America Travel Guide by The Discoveries Of. After saving the town invading Pirates, the boys released us from our battle stations, allowing us to explore the rest of the city. We headed straight to the picturesque Calle de los Suspiros. The origin of the street name, Street of Sighs is unknown, but the street is very popular. With its antique mud and clay buildings, Calle de los Suspiros is probably the most photographed street in Colonia. When deciding between Montevideo and Colonia for our day trip, this was one of the places that made Colonia win in my books. The cobblestone street is lined with shops and restaurants whose storefronts have stayed true to their roots over the centuries. 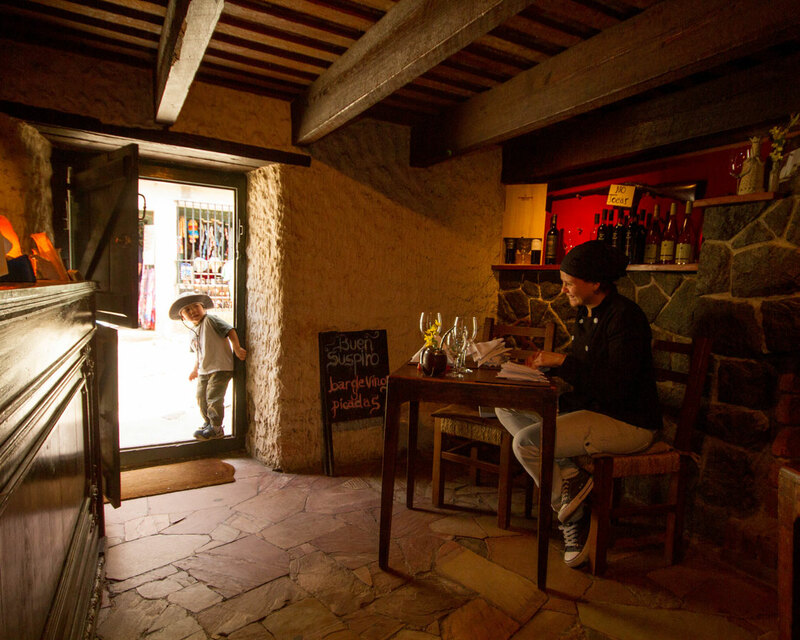 Along Calle de los Suspiros is a tiny, but, gorgeous restaurant. It has classic architecture and ceilings so low that Kevin had to duck when we walked around. It was one of the boys’ favorite places to explore. Everything seemed just the right size for their little bodies. The restaurant was just getting set up for the day, but we were able to buy some delicious treats. By this time, it was midday and the boys were asking about lunch. So we made our way to a nearby sandwich shop. As we walked into the building we noticed that D was no longer with us. Kevin and I looked at each other in confusion before immediately separating and calling his name. Seconds turned into minutes and before long all the artisans in the market had stopped selling their wares and were helping in our search for our 3-year-old. Thankfully, one of the artisans found D back on the Street of Sighs. We thanked the folks in the market profusely for their selflessness and kindness and took a moment to collect ourselves before grabbing some lunch. After our hearts had begun to beat normally, we managed to grab some food. Then we headed towards the water by walking along Paseo de San Gabriel. The weather was warm and we were thankful for the large sycamore trees that provided some shelter along the way. We passed many interesting museums but decided not to stop as the boys didn’t show any interest in going into any of them. The boys could have played by the water for the rest of the day. They loved chatting with the local fisherman about their catch. Next, we wandered over to Puerto Viejo, the main marina in town. It was not hard to imagine what beautiful sunsets you can catch from the pier. To convince the boys to leave the serenity of water, we had to resort to our go to bribe of ice cream. As we were on the lookout for an ice cream shop, we headed towards Plaza de Armas to visit Uruguay’s oldest church, Iglesia Matriz. 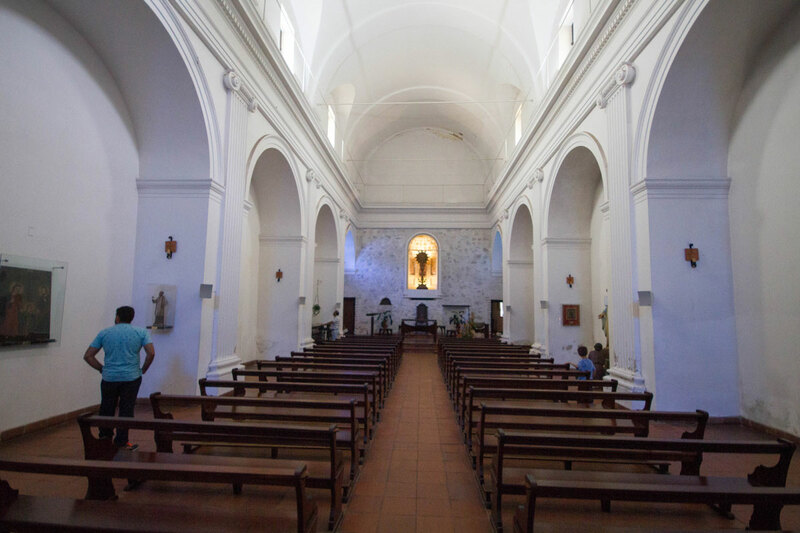 Also known as the Basilica del Santisimo Sacramento, the church was built by the Portuguese around 1680. However, the original structure was destroyed in the early 1700s. It has since been twice rebuilt by the Spanish as recently as 1976. After visiting inside the church, the boys started running around the plaza, where they discovered some areas that were roped off. It turns out the plaza houses the foundations of a house that was built in the 1600s under Portuguese rule. As mid-afternoon was approaching we decided to head over to another popular square, Plaza Mayor 25 de Mayo. We wanted to climb the lighthouse. It is said to provide amazing views of the city. We wandered around the stalls selling local handicrafts. Then, we headed to the lighthouse where there was a long line-up of people waiting to head up. As we were reading the entrance costs, we found out that C and D were too young to climb, So, we decided that only Kevin would go up to take some shots. The kids and I headed back to the plaza. C and D were not disappointed at all as this gave them the chance to play tag with the other kids. The 19th-century lighthouse is unique as it has a square base and cylindrical top half. The lighthouse can be seen from many vantage points in the city and flashes a white light (previously red light) every eight seconds. Originally kerosene powered, today it uses solar panels. Interestingly, the lighthouse was actually built on one of the towers of a convent the now lies in ruins surrounding it. The 17th century Convento de San Francisco was completely destroyed by a fire in 1704. Although, after so many decades, the walls, doorways, and window frames are still recognizable in many spots. This is a perfect spot for exploring. Just as the boys were losing hope, alas, we finally found some ice cream! The kids devoured their ice cream as we watched a mime entertain visitors that were entering the town. Kevin, who is an ice cream connoisseur said it was one of the best ice creams he has ever tasted. The boys and I wholeheartedly agree. 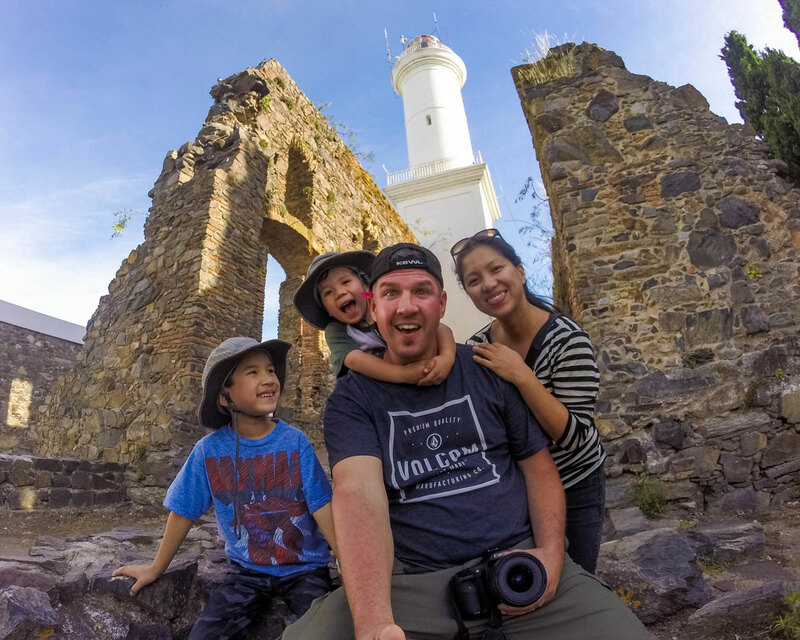 We are glad we took a family day trip to Colonia, Uruguay. 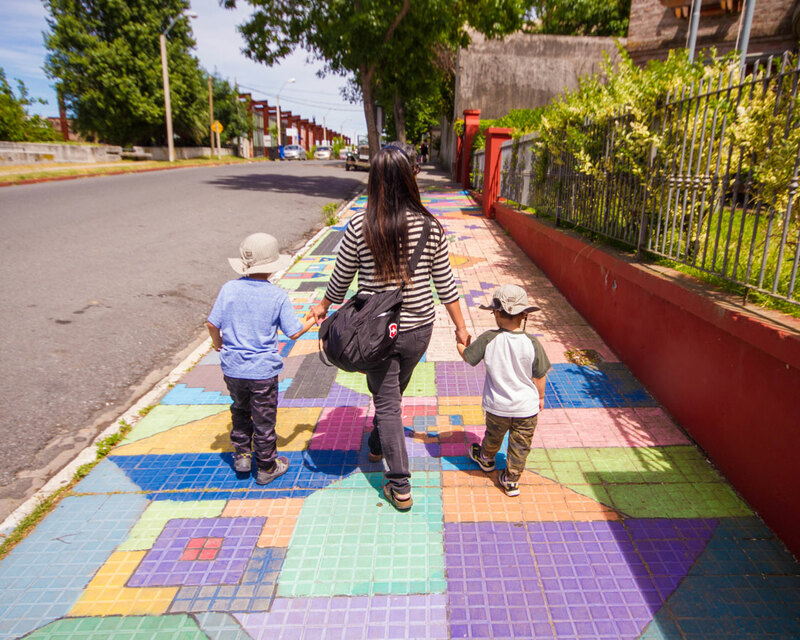 It was a nice break from the hustle and bustle and visiting Buenos Aires with kids. C and D had a great time exploring and running around. We cannot wait to explore more of Uruguay and will definitely be back in this country soon. 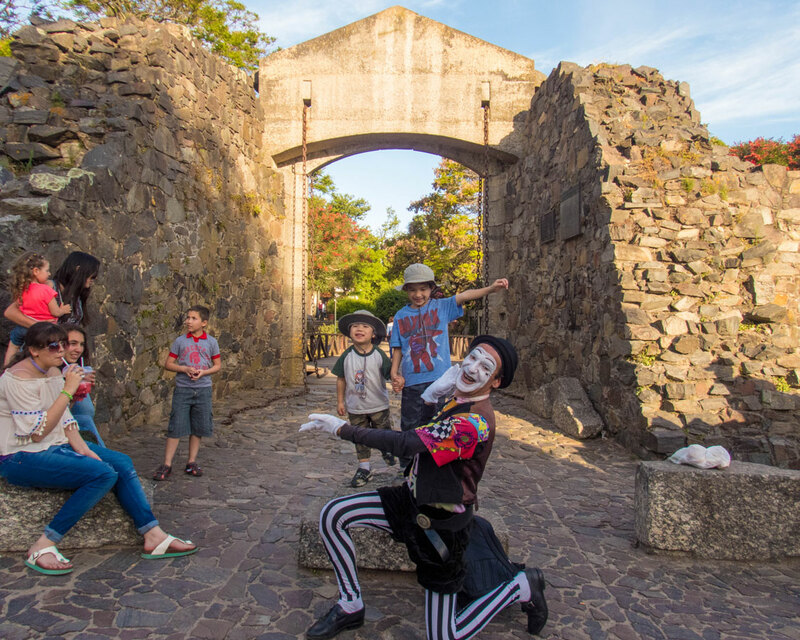 Have you visited Colonia del Sacramento with kids? What was your favorite experience? I think it is so neat that you are able to take your kids along to destinations others may deem unsafe. They will be well rounded citizens experiencing this all so soon in life! That must have been so scary to lose D. Yikes, not a fun feeling. The trip sounds amazing though. Looks like a beautiful town. Sounds like a a fantastic trip and something the entire family can enjoy. I’m glad D wasn’t too far away. Thanks Katie! So were we! So great that your kids get to experience travelling at such a young age. Love the cobble stone streets. This is my dream town to LIVE in, not just visit. I love how much fun kids and adults can have exploring such an historic place. It’s so true! The magic of stepping through time and letting kids imaginations run wild is a blast! This looks like an amazing day trip. I love the added video. My heart actually skipped reading about losing your little one for a few minutes. This has happened to us and minutes seem like hours! They can wander off so quickly – in just a blink of an eye. Thanks Allison! It was devastating when it happened. We were so grateful to all the people in the market for their help in tracking him down. Losing a child is the most helpless feeling! Thank goodness you found your little boy! This looks like such an interesting place to visit. You had an amazing trip, Kevin! The video left me speechless, this place is worth visiting! Christina, That’s my go to bribe for Jim, too. C’mon honey, just X more photos then we can go get ice cream. LOL. I would love to visit this little town. Superb Post…! Thanks for inspiring lots of parents to plan their kids vacation.. Really worth spend some time on this…The pictures are stunning.. Every kid should travel places like this. Great Post..! really an inspirational post for the parents. The pictures convey the beauty of this place effortlessly. The video is amazing. And i am really a happy follower of this blog.. These kids travel stories are really interesting and adorable as well. Hopefully I get there someday to experience all and loose myself there.